By all accounts, it’s this year’s top equestrian travel destination, so we thought we’d follow up on our World Equestrian Games Travel Tips with an itinerary for an equestrian-themed day trip to historic Louisville, Kentucky. From Lexington’s Kentucky Horse Park, it’s roughly a 1.5 hour drive to Louisville. 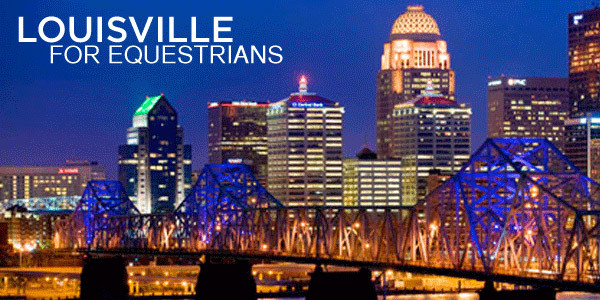 Founded in 1785 and situated along the banks of the Ohio River, Louisville is the largest city in Kentucky and is best known for the arts, architecture, and, of course, Churchill Downs. On the way out of Lexingon, catch a quick bite at Keeneland, the top racing facility and Thoroughbred sales complex in the country. Keeneland’s track kitchen serves up a meat and potatoes breakfast to jockeys, trainers, and other denizens of the track, as well as visitors, daily and year-round from 6am. With a full belly, but still hungry for a bit of historic urban culture, head directly to Louisville’s West Main district, a neighborhood of shops and galleries that’s listed in the National Register of Historic Places and recognized as the largest collection of cast iron facade buildings outside of SoHo. If you’re like us, finding good coffee in foreign places is a travel essential! On West Main, Mrs. Potter’s Coffee Lounge & Cafe is a friendly place to fuel up for the day ahead with great coffee drinks and lighter fare like bagels and pastries. West Main is also known as "Museum Row" and we recommend either the Kentucky Museum of Art and Craft or the nearby Speed Art Museum, Kentucky’s oldest art museum with over 13,000 pieces in its permanent collection. For lunch, head to the landmark Brown Hotel, built in 1923 and original home of the famous "hot brown," an open-faced sandwich of turkey and bacon, covered in Mornay sauce and broiled until the the sauce begins to brown. Don’t even think of ordering anything else! Of course, no equestrian should miss the chance to visit and go on a tour of Churchill Downs, located in South Louisville. Start at the Kentucky Derby Museum where both the "Behind the Scenes" and "Barn and Backside" tours start at convenient after-lunch times. If the history and grandeur of Churchill Downs whets your appetite for a bit of shopping, we recommend a stop at Joe Ley Antiques. This shop boasts two acres of treasures in an 1890 schoolhouse and is perennially noted as Louisville’s best antique store. Don’t miss the vintage Kentucky Derby collectibles. Make your last stop the 21c Museum Hotel, voted the 2010 Conde Nast award winner as best hotel in the world for design. Peruse the art collections or head directly to the hotel restaurant, Proof on Main, to sample their carefully-curated list of small batch, artisan bourbons. Wow. I appreciate the cuisine and cafe options in Louisville. I have a better idea of what to pick out and expect when I make my visit there this year. Thanks!